BSW are one of the leading companies in the South-East when it comes to installing environmentally friendly, renewable energy technologies. Our experience and expert knowledge in the design and installation of Air Source Heat Pumps ensures a more efficient and cost effective way of heating your home. 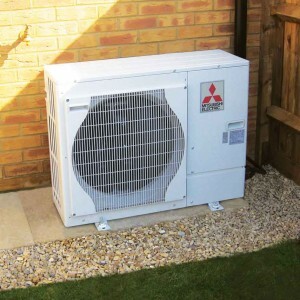 With our partners, Mitsubishi Electric, we can offer a 5 year manufacturer warranty on the Air Source Heat Pump and control system through the Business Solution Partner scheme. An Air Source Heat Pump is a highly efficient way to heat and provide hot water for your home. Heat pumps use electrical energy to extract low grade heat energy from the outside air, to heat a refrigerant, which in turn heats water for space heating and stored domestic hot water. The operation of a heat pump is similar to a refrigerator – but in reverse. This process is known as the vapour compression cycle. The Renewable Heat Incentive is the world’s first long term financial support for the generation of renewable heating and hot water. It was introduced to encourage and reward the uptake of renewable technologies, such as Air Source Heat Pumps, whilst lowering the UK’s carbon emissions. The Domestic RHI payments will be tax free and made quarterly straight into your bank account. RHI payments will vary depending on the size of your property and the levels of energy demand. Currently an Energy Performance Certificate (EPC) less than 2 years old is required for your property to access the scheme. At the current rate, a typical 3 bedroom property with a 15,000 Kwh annual heating and hot water demand would yield an annual payment of approximately £700. Factor in the additional savings in running costs, compared to traditional fossil fuel systems, and the benefits are even greater. We will be able to talk you through RHI and what it could mean for your individual household, giving you a better idea of how much you can earn through the RHI. As a friendly, family-owned business BSW take huge pride in providing the best service from our initial visit through to the completion of a project. We don’t believe in hard selling, we want to give good, well-informed advice from our team of expert surveyors, allowing you to make an educated decision on what would be a long-term investment. We are qualified under the Microgeneration Certification Scheme (MCS), authorising us to design and install renewable energy systems. Our MCS accreditation means we are up to date with all the latest advancements in the renewable energy sector and ensures all our work is eligible for the RHI, giving you the reassurance you need. For some reliable advice or to talk about how BSW can help you make the step into environmentally friendly energy, contact us today. You can either call one of our highly knowledgeable team on 01444 831138 or by filling out the contact form below or on the sidebar to the right. We look forward to hearing from you.